Item #DB-939: 29" long continuous Necklace with twenty-eight 18-21mm Carved Chinese Turquoise Dragon Beads and twenty-eight approx. 6.5mm Cultured Pearls. Item #Z-171: Bag of assorted gemstone beads including Quartz of many colors, Fluorite, Turquoise, Lapis Lazuli and others. Various shapes may include nuggets, chips, rounds and discs. 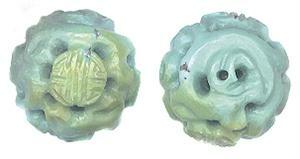 Item #TC-TQP-20: Sterling Silver pendant with 12mm round carved Chinese Turquoise Dragon bead and Pewter accents. Item #MBA-1-20: One pound bag of drilled gemstone beads.Contains all shapes, sizes and colors. The 4"x6" plastic bag will contain an average of 260 gemstone beads. These beads are perfect for creating your own earring, bracelet or necklace. Item #RBA-10-18-14: 10-18mm fully-drilled round gemstone beads in assorted materials. Approximately 250 grams TW. 135 pieces.